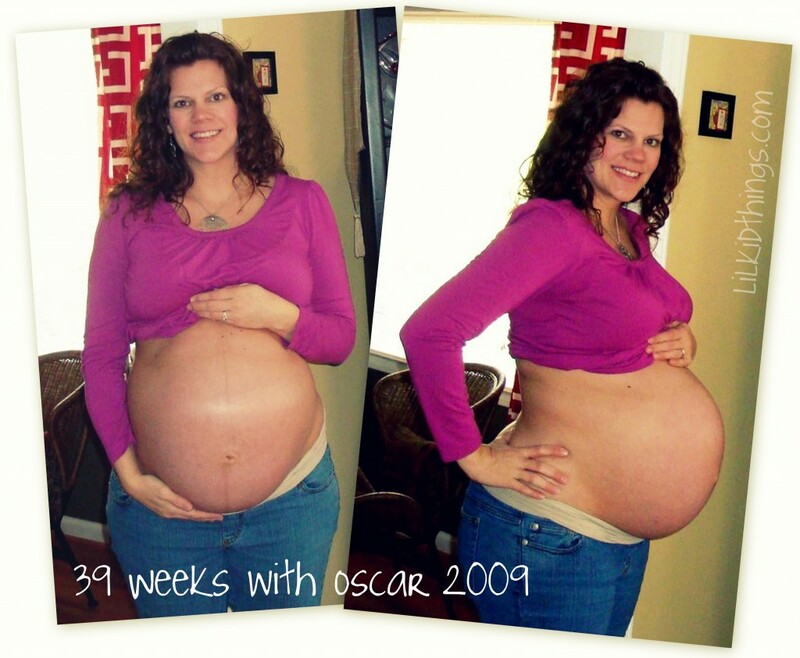 You may remember that Oscar was a whopping 11lbs when he was born. Maybe because you read my birth story, or maybe because I bring it up quite regularly on this blog. You see, 11lbs is a lot of baby. This time I am really hoping that our boy will be in single digits despite the statistics that 2nd boys tend to be bigger than their big brothers. Today I am 39 weeks exactly and I would like to think my belly is a bit smaller. I would also like to go into labor today. hopeful for you. You look fabulous! Are you sure you aren’t just saying that because I am your sister?? I think your belly is much smaller. You have such a cute preggo belly. Sending labor vibes your way hun. Girl you look sooooo great…but I am sure you are ready to have the baby! I don’t think the second baby is bigger theory is really accurate. All 8 of mine have been all over the board my biggest (# 6) almost 11 pounds and 3 weeks EARLY and my smallest and last baby 7lbs 11oz. almost a month early. I have had three 10+ pounders and they have all been 2+ weeks early so I think it must just run in the family and my body can’t handle anymore so I go early (thank the lord!). You look great and not as big as your first so maybe you will prove this theory wrong too! That’s so interesting about all your other kids! and yeah Oscar was a week early and STILL 11lbs. Can’t imagine if I had gone over!! I think you look smaller this time too. I think keeping active by chasing around Oscar and such has probably helped keep baby U2 smaller too. Thanks! I like my hair better now too…Though Jerry disagrees. And I think you are right about being more active. It definitely helped. granted the active toddler bit didn’t help me have a smaller 2nd baby but perhaps if he wasn’t 2 weeks late. Thanks! And don’t worry, I am doing everything I am supposed to do! Definitely smaller. I was the same way with m second compared to my first. I think it is because you have a toddler in the house, there for no chance for calories to linger. I think you are right. Let’s just hope that trend continues AFTER he is born! I’m not sure about the 1st vs 2nd baby theory (I’m working on my 1st), but in the pictures you are smaller this time around. And absolutely gorgeous in both sets of pictures! I’ll have you in my prayers! Thank you so much! And congrats on your baby as well! I’d say definately smaller – but either way you look absolutely beautiful!! It won’t be long now!! Definitely smaller & lookin’ good! Hope you get to meet lil brother soon! You are definitely smaller. I don’t understand how a woman as small as you can have a 11 lb baby where did you keep him? All kidding aside you look awesome. I hope that while I’m typing this you already had the baby, b/c I know you’re ready. That myth is bunk. My 2nd was 1.9 lbs less than my first (who was 9 lbs). Two pushes and she was out. After moving on to the weather for the week after reading this… I hope you go before Tuesday and can spend the 99 degree day in the hospital holding a sweet baby instead of running around in the heat. Best of luck!!! And yes, belly is definitely smaller this go round. You look awesome and totally smaller! Can’t wait to hear your news. Labor vibes!! And you look totally different with long hair…crazy! Lordie Lou! 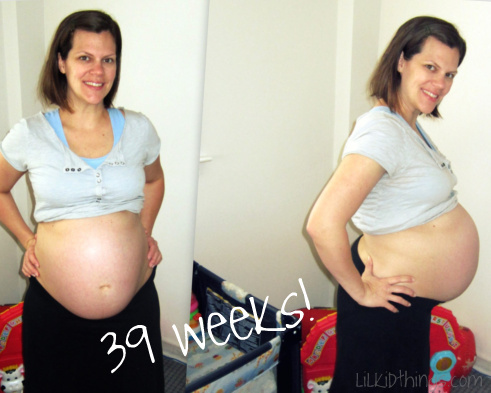 You look fantabulous at 39 weeks! Looking forward to hearing the delivery news soon, Andrea. Thank you all SO much for the wonderful comments! Even if I end up with a 13 pounder I feel so much more positive now! Love the support and I SO appreciate it! Can’t wait for you all to meet little U2! It does look smaller!! I so hope you have the baby this week! Are you going for a VBAC? Wow! That’s an impressive belly. 🙂 You look great. Much better than I felt at 39 weeks!! I had an 8lb baby boy first, 10 days later, then a just-under-8lb baby boy born ON his due date. No matter what, the second time’s easier because you’ve been there, done that before. Or, as in my case, if not easier than usually shorter!! Good luck!